French trading Spit barge built of riveted steel in 1955 by Plaquet at their French site in Mortagne du Nord. Our vendors traded the vessel for twenty years before converting her to a comfortable home that has retained original lines. From the stern the boatmans cabin is accessed from the wheelhouse and has retained its original charm and comprises a kitchen / saloon, a bedroom with a 190 x 125 bed and a shower room /WC. A real self-contained appartement independent of the rest of the barge. The hold has been converted to very comfortable accommodation with 2.5m headroom & plenty of natural light. Main entrance gives access to a hall way on the starboard side. Moving aft is the spacious well equipped kitchen / dining area followed by the lounge. Practical, comfortable & homely, take a good look at the videos photos & VR this is a remarkable conversion beautifully maintained. Aft of the lounge is a double guest bedroom. In the entrance hall is the main bathroom with hydro-massage shower and Jacuzzi style bath. The WC is separate just forward and stairs to the terrace deck. Forward to port is an office with sofa bed & to starboard a bedroom with double bed. Forward again to the laundry room and then on to the workshop. All well equipped and well fitted out. The whole boat is heated by radiators fired by a diesel boiler which also provides hot water. Water comes from the mains but can also be taken from the water tanks whilst cruising. Deck wash is by filtered river water. The boat is insulated by Rockwool (16mm in the roof & 10mm in the sides). 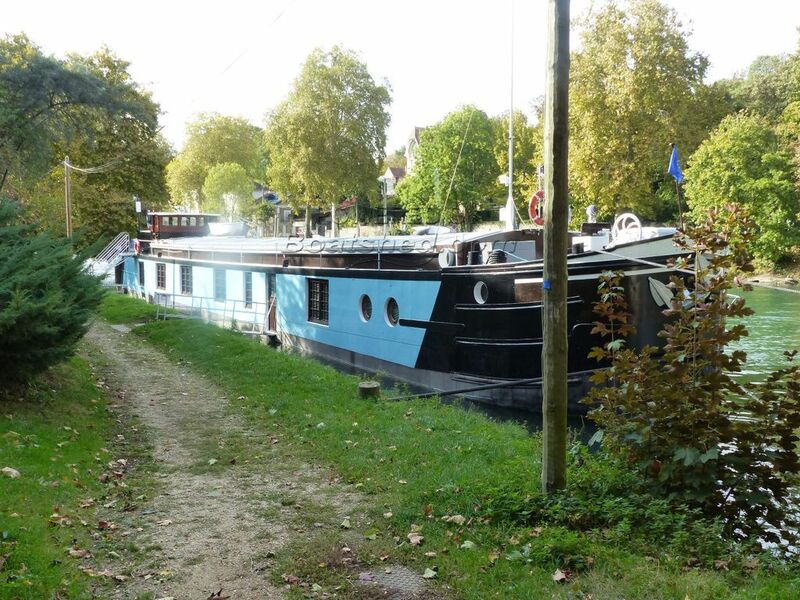 This Peniche Freycinet Residential Barge has been personally photographed and viewed by Pascal GAETAN of Boatshed Paris. Click here for contact details.